Hey, Whatever Happened to the 64DD add-on? Many of us remember hearing about the 64DD so much, simply because Nintendo delayed it to death. For an in-depth history of the 64DD and statements from Nintendo regarding it, check out this Nintendojo article. 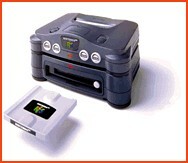 The "64DD" was a disk drive add-on announced for the Nintendo 64 before the system's launch. Wasn't it Supposed to "Extend" the N64's Life? The 64DD was a highly-anticipated device that never saw the light of day outside of Japan. Though the originally rumored/planned features included a modem, satellite networking, an internal clock and a 4 MB RAM Expansion Pak, the most appealing feature of the 64DD was writability. Unlike "read-only" CDs, the DD format was created with the intention of gamers updating, customizing and interacting with their games at a creative level. Unfortunately, the 64DD was repeatedly delayed. Several games that were believed to be in development for the add-on (Donkey Kong 64, Pokémon games, Earthbound 64) were all moved to cartridge. Though it was believed that Nintendo did not want to "split the market" by introducing the add-on, Nintendo later claimed there was "no need" for the 64DD, as all games planned for the DD could be done just as well as cartridge. Through such statements and the numerous delays, it became clear to both gamers and developers that the device was not going to be introduced in the US. It has now finally been released in Japan, though certainly not in the fashion it was originally intended. However, while the add-on itself failed to "extend" the N64's life span, it will appeared in some form. The SD Adapter, which was displayed at Spaceworld, has proven to be the successor to this “DD Technology”, and will allow for writeability on the GameCube. What is the "DD Technology?" "DD Technology" was just a term used by this FAQ to encompass a writable disk format. Similar to the popular Zip disks, it is relatively durable and provides a good deal of writable space -all of which for a relatively low cost to produce. With this device integrated into the system Nintendo would be utilizing a sort of swappable hard drive. + Since this is a technology Nintendo has already invested a good deal of time and research into, it could likely keep the price for a system using this technology as well as a DVD to a reasonable level while adding some major functionality. With Microsoft’s X-Box certainly possessing a hard drive and and Sony expressing interest in a hard drive add-on (Sega also expressed interest but failed to produce one for Dreamcast) a solution like this may be best for Nintendo. Aside from having virtually unlimited space available to its consumers (you could always buy more disks) Nintendo would also have an edge over the likes of both Sony and Sega in that the writable technology would be included out of the box, not requiring an add-on that splits its market and creates a situation where many developers would choose not to utilize it in fear it may affect their sales. + With its own creative departments (including Miyamoto himself) having expressed some interest in the ability to use writability to make more interactive games, Nintendo will likely seriously consider doing what will make its own people happy. + While it hasn't always worked to their advantage, Nintendo is the most independently-minded company in the industry, never settling for merely doing what everyone else does. If Nintendo believes that writability can change the industry and has some proof of that potential it will be likely to stick its neck out to implement it. + With writability comes some interesting possibilities for game distribution on Nintendo's part. In Japan Nintendo used writable disks for game distribution before, and with the Internet so popular and powerful in the United States a plan could potentially be developed down the road to make traditional distribution methods and the costs involved with packaging and shipping obsolete. - Even if most of the research and planning has already been done for the 64DD in advance there still has to be some bottom line cost to adding more hardware to the system… depending on how much it is this idea could be dead before it starts. - Without an immediate display of what power writability can provide at (or preferably well before) launch a system using writable media will lose most of its punch, both EAD and Rare will need to be working overtime to show what a writable Nintendo system can do that no other system could. Without this display of power early on the interest of other developers is likely to plummet. - There could be some carry over of bad feelings about the medium after the failure of the 64DD, which came partially through the general lack of interest developers showed in the capability to write data to the disk. - Critics have validly pointed out that computers have always had the capability of storing data on them and yet no revolutionary things have been done with this capability yet, so why expect anything different if someone in the console industry provided this function. Why else would Nintendo consider DD technology? Although the company ultimately went with DVD, Nintendo had good reasons to consider the DD technology as a primary format. First and foremost in this industry Nintendo has always taken the role of the innovator, willing to take risks in order to forward its own way of doing things. In the case of the Nintendo 64 and the 64DD Nintendo generally failed this round. That doesn't, however, make it safe to assume that Nintendo won't continue to try. Bottom line, if Nintendo does manage to make a host of titles that show the industry what kinds of innovations are possible with the SD technology, the company would probably have the best opportunity to reclaim its spot at the top of the industry. While this could be quite a gamble, given the creative minds they have in-house Nintendo has the best chance of any company to deliver on an idea of this kind. If Miyamoto and company can make a compelling presentation this decision could be in stone. Add in the alternative distribution methods that are possible and Nintendo could surprise some people if the whole process is well thought out and implemented. So with no 64DD for N64 and now using an optical medium as the NGC's format, writability on a Nintendo system isn't happening, huh? Not exactly - as stated above, through Matsushita's rewritable SD Cards for NGC, gamers may actually be able to experience many of the functions originally planned for the 64DD. The cards will supposedly interact with both the NGC and the GBA. Why Not a Hard Drive? A perfectly valid question with a few interesting answers. First, Nintendo doesn’t want to have developers thinking they’re suddenly working with a PC and installing a big chunk of stuff onto the hard drive for the game to run from. Second, by making the cards removable you leave the door open to unlimited space, create a situation where a person’s data is much more portable (not bound to the system). Finally though, hard drives are plain expensive if you’re looking to make a low-cost console. That said, the current price for Panasonic SD cards is still quite high. However, in the coming months the inital price point is expected to drop substantially. There has been some indication that Nintendo may be considering a hard drive as an add-on but no confirmation or details on this possibility are availble as of yet. The 64DD encompassed a lot of work, R&D and investigation into new types of games. Problems, confusion and delays prevented developers from exploiting the promise of the device, no matter how much they wanted to. Given a breath of fresh air and a new start with the GameCube there is a great opportunity for Nintendo to show developers what it may have learned with the 64DD and make the writable media concept go over big. Certainly the worst situation Nintendo could find itself in is for Sony to successfully get a hard drive out first and show why writability should be included in all consoles. Only time will tell but with the XBox having a hard drive included with the system, Nintendo may see the writing on the wall and take a chance.